Brittany Ferries could increase freight capacity at ports west of Calais, post-Brexit. The cross-channel ferry operator has confirmed it has looked at increasing the frequency of services into ports such as Cherbourg and Le Havre in Normandy. However, it has said that contingency planning is almost impossible, even as the Department of Transport has written seeking clarity on spare capacity options. That’s because hauliers could face fewer opportunities to cross on the western channel post-Brexit. The company has been warned that every vehicle carrying refrigerated goods, food and other natural products may face inspections upon arrival in France after Britain leaves the EU. Around one third of the 210,000 freight units carried by Brittany Ferries every year would be affected. The infrastructure needed for this task – huge warehouses – does not exist in ports like Roscoff, St Malo or Cherbourg. Nor is it likely to be constructed by March 2019. Some ports may also be excluded from preparations completely, meaning fewer entry points for hauliers into France and rendering pointless plans to boost capacity. “The British may take a pragmatic approach and wave lorries through upon arrival into the UK,” said Christophe Mathieu, Brittany Ferries CEO. “But cross-Channel trade works both ways. In a worst case scenario, British hauliers carrying refrigerated goods could face the prospect of far longer journeys – perhaps hundreds of additional miles – to find a French port equipped to process their consignment. When they finally get there they could encounter further delays waiting for checks to take place. 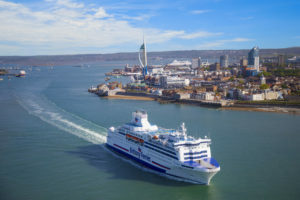 Brittany Ferries operates from three ports in the UK: Portsmouth, Poole and Plymouth and serves five in northern France: Le Havre, Caen, Cherbourg, St Malo and Roscoff. The fleet comprises eleven ships and also serves two ports in northern Spain. As well as around 210,000 freight units, the company carries approximately 2.5 million passengers every year.